Harriet and Penelope loved to do things together. Best of friends for many years, the two spent most of their time with each other. They went to tea parties, movies, brunch and shopping. Penelope smelled of moth balls and peppermint drops. Harriet reeked of cheap lavender perfume which she generously dabbed behind each ear. The drive to the zoo was uneventful. They spent the entire day going from cage to cage, watching the flamingos and rhinoceros. 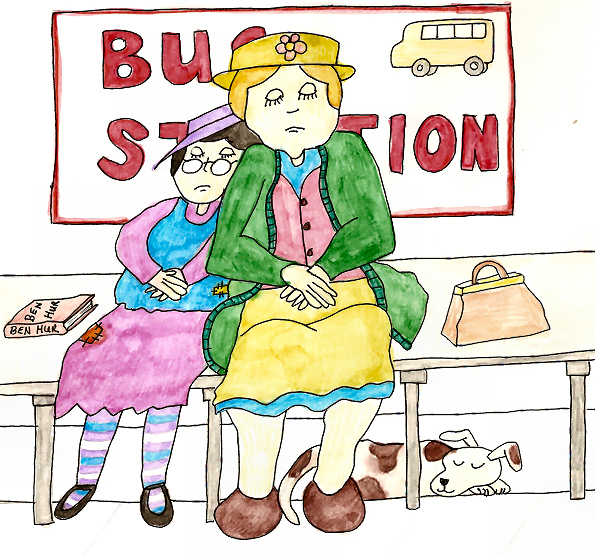 As the afternoon sun lowered in the sky, the two ladies walked back to the bus station. “Oh my, Harriet. It seems as though we missed the bus. There's another one coming in an hour.” Penelope sat on a bench. “I'll just read my book,” Harriet said. Penelope blushed as the man opened the car door for them. “Thank you, Larry.” She sat in the back next to Harriet as Mr. Ingalls drove them home. Her elbow nudged Harriet in the side. When Harriet looked, Penelope smiled. Once they arrived home, Harriet and Penelope invited Mr. Ingalls in for some tea. He parked the car and joined them while they told him of their adventures at the zoo. “It's a good thing you've got each other for friends, isn't it?” Mr. Ingalls grinned. “Yes, it is.” And Harriet sipped her tea.